Concrete repair material and concrete restoration products are required on almost every decorative concrete project in North Carolina and South Carolina. Sometimes concrete repair material and concrete restoration IS the project. We have a comprehensive range of material solutions for concrete repair and concrete restoration and can help you decide the best combination of material systems for your project. From coating removal products and cleaning to crack treatment systems and repair mortar bag mixes, you can count on us to have exactly what you need for your next concrete repair material and concrete restoration project. Comprehensive technical support and training is available for each of these concrete repair material systems. Deep Patch concrete repair mortar is used for patching large holes in damaged concrete surfaces. SureCrete Design Products Deep Patch is a just-add-water concrete repair bag mix that will fill voids and other damaged areas of concrete floors from one-eighth inch up to two inches. Deep Patch may be extended with aggregate for thick concrete repairs. Use Deep Patch to fill concrete floor spalls, build ramps, repair loading dock areas and to level concrete slabs. Flash Patch is a single component cement based thin concrete repair patching compound system providing a workable, no-slump patch that sets quickly for a fast return to service. Just add water concrete repair bag mix system for concrete repair up to one inch thick. Self bonding concrete repair. SureBroom is a superior high-strength thin concrete texture overlay system for extreme high traffic areas. SureBroom is a just-add-water concrete repair mortar used to repair and resurface worn and damaged concrete driveways, parking lots, loading docks, sidewalks and other concrete slabs. The thin concrete overlay repair mortar may be finished smooth or in broom texture. 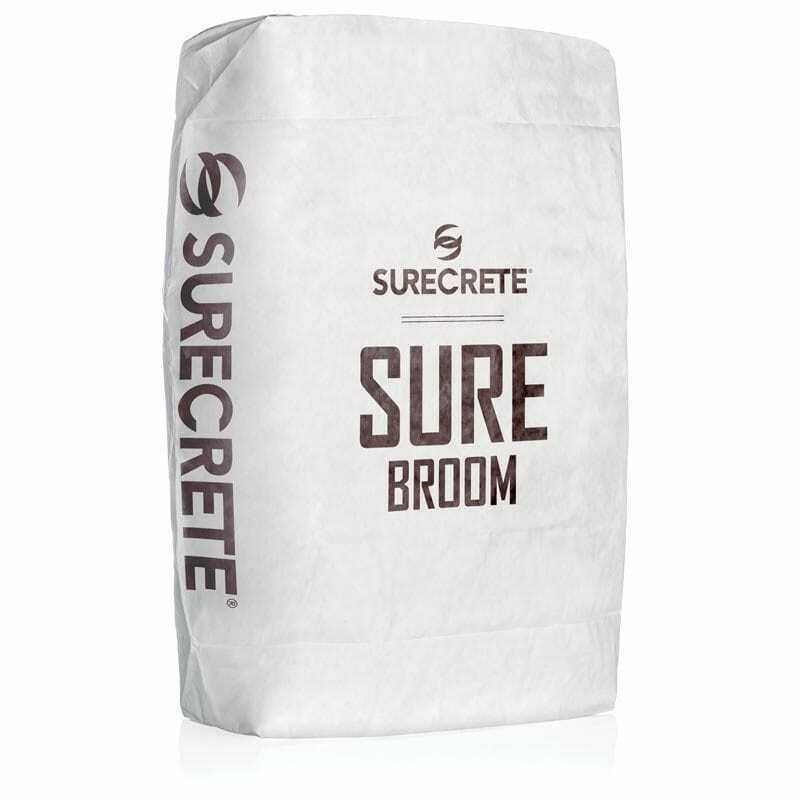 SureBroom traffic rated concrete repair overlay bag mix is available in natural gray color, and also in white base which may be colored using TruColor integral overlay color packs. SureBroom achieves over 6000 PSI when cured, which is significantly stronger than most other concrete texture overlay products. Surecrete SCT-22 concrete crack treatment is a rapid set, technologically advanced, high strength, ultra-low viscosity urethane treatment material. This two-part, 1:1 system is 100% solids, no VOCs and designed for rebuilding spalls and treating static cracks in concrete very quickly. 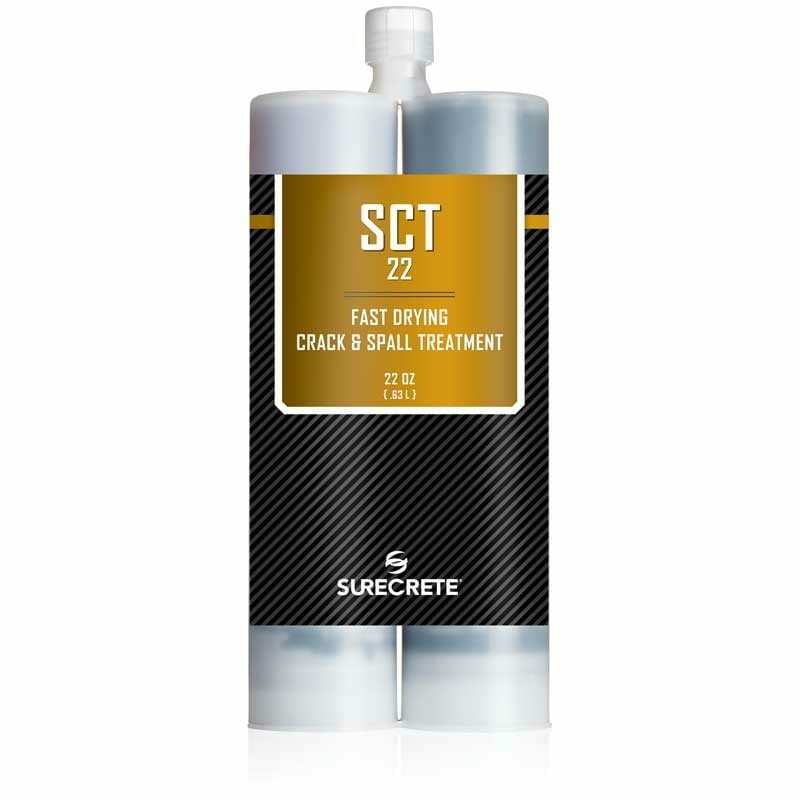 SCT-22 concrete crack repair product may be used before the application of an overlay for concrete that has random cracking or as a stand-alone treatment for hairline cracks and damaged concrete. SCT-22 concrete crack repair may be used with or without clean aggregate sand filler. 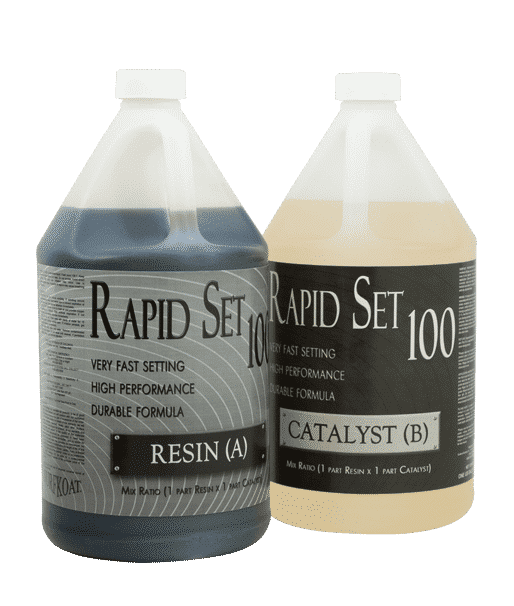 Rapid Set 100 is a very fast setting, high strength ultra low viscosity concrete repair material. This two-part, hybrid urethane system is designed for rapidly rebuilding deeply spalled or damaged concrete surfaces, broken control joints and repairing damaged concrete rapidly, even in cold conditions. Rapid Set 100 can accept heavy loads in 10 – 15 minutes. Roadware 10 Minute Concrete Mender is a high-penetration two-part hybrid urethane that combines with sand to form a tough instant polymer concrete. This nearly water thin formula is designed to microdowel deep into the host concrete creating extremely high bond strengths, reinforcement of the repair area as well as permanent repairs. Roadware 10 Minute Concrete Mender produces polymer concrete repairs that absorb the shock and transfers the load of heavy traffic without cracking or disbonding. It is highly chemically resistant and can be applied in a wide range of temperatures. It is excellent for industrial floor repairs subject to forklift traffic and harsh conditions. 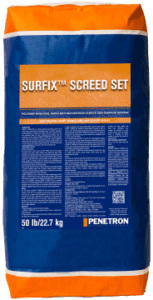 SURFIX BLEND PATCH performs as a fast-setting, cement-based, one-component, polymer-modified, concrete and masonry patching material ideally suited for horizontal, vertical and overhead repair applications. Used for filling honeycombs and spalls on above or below grade, vertical and overhead cementitious substrates. Perfect for patching precast products, concrete pipe, curbs, sidewalks, bridges and wall panels. 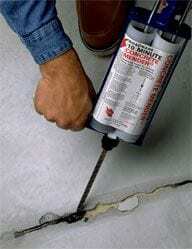 Can be used to correct substrate irregularities of forms or unconsolidated concrete. 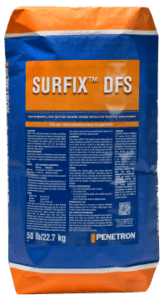 SURFIX DFS is a high early strength, fast-setting, cementitious compound used for areas where fast repairs are necessary and the concrete surface must be put back in service promptly. 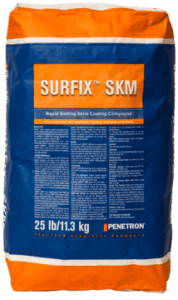 SURFIX DFS concrete repair material is excellent for use in areas that are exposed to cold temperatures. Used from 1/2″-2” thick and can be extended with aggregate for thicker repairs. 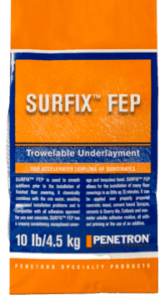 SURFIX FEP is a cement-based, rapid-setting underlayment used to smooth subfloors prior to the installation of finished floor covering. It chemically combines with the mix water, avoiding associated installation problems and is compatible with all approved adhesives. SURFIX FEP has a creamy consistency, exceptional coverage and durable bond. For more information on how to repair and restore concrete, concrete repair material advice and product takeoff assistance, call us at (Charlotte) 704-333-4235 or (Raleigh) 919-794-7442. Use the Contact Us page and we will respond as soon as possible. Please stop by one of our showrooms in Charlotte NC or Raleigh NC for more product information on these material systems. 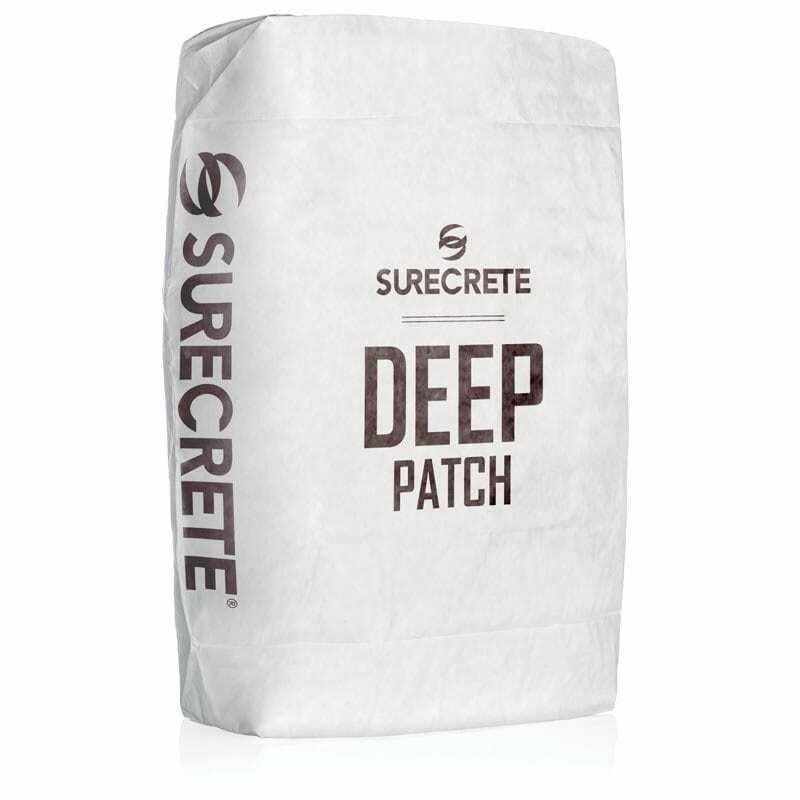 SureCrete Design Products Deep Patch concrete repair mortar bag mix is a single component, just add water cement based chemical patching compound system providing a patch that goes from 1/8″ to two inches neat. Deep Patch concrete repair is a suitable alternative to destroying old, damaged concrete and having to replace a new slab entirely. Concrete repair made with Deep Patch is ready for the application of a finish texture cement overlay after just twenty four hours. Deep Patch is used to repair concrete in North Carolina and South Carolina. 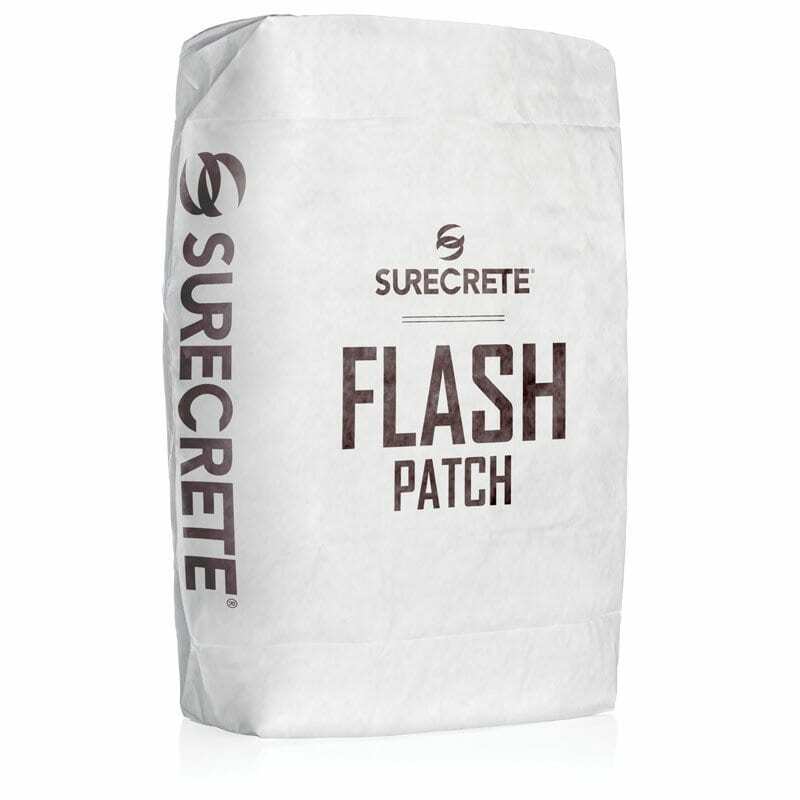 SureCrete Design Products Flash Patch concrete repair bag mix can receive a finish coat in a little as one hour. Flash Patch just add water fast setting concrete repair mortar is as easy as mix concrete in a bucket. Flash Patch offers superior bonding power without additional bonding agents. This concrete repair bag mix system is able to patch low spots, divots, and spalls in concrete floors. Available from Turning Point Innovations in Charlotte North Carolina.Flash Patch is designed for heavy traffic concrete repairs, as it has the resilience to patch commercial loading docks, parking lots, walkways, entryways, and parking garages. SureCrete Design Products SureBroom is engineered to transform old, spalled and broken concrete to a freshly surface in a variety of finish textures. Typical areas requiring SureBroom traffic rated concrete repair overlay include parking decks, driveways, sidewalks, parking lots, and retail storefronts. SureBroom may be applied with a concrete broom or by a combination of compressed air spray equipment and trowels or squeegee. Concrete repair and concrete surface texture restoration using SureBroom is often more economical than demolition and replacement of concrete slabs anywhere in North Carolina or South Carolina. The rapid set time of SCT-22 Concrete Spall and Crack Treatment System makes it the best concrete crack repair material option for industrial warehouse floors with high traffic area spalls and joint damage, anywhere in North Carolina or SouthCarolina. Fast cure concrete repairs are ready for heavy traffic in as little as 45 minutes. SCT-22 Concrete Repair System cures from -20 degrees F to 130 degrees F. SCT-22 is a USDA approved concrete crack repair system and an FDA approved concrete repair material. Minimal down time allowing the user to offer quick return to service. Works well even in cooler temperatures. Ultra low viscosity formula allows for easy application. Excellent for use under seamless floor applications. Many other concrete floors where cracks, spalls and other damages are present. Use for both interior and exterior applications. Can be applied overhead and vertically without the use of forming aides. Apply to 1/4-2”. Fast-set mortar that can be troweled, shaped and shaved after initial set. One-component, only add water. Bonds tenaciously to cement-based substrates. Set time is approximately 30 minutes. 0.48 cu ft, or approximately 23 sq ft at 1/4” thickness. Concrete roads and highways in North Carolina. Bridge decks and parking garages in South Carolina. Airport runways and taxiways. Warehouse and distribution centers. Manufacturing and storage facilities. Cold storage and food processing plants. Loading docks and wastewater treatment facilities. One component product mixed with clean water. No need for primers or liquid activators. A hydraulic-based, non-corrosive cementitious product that is fully compatible with concrete. Fast-setting and rapid-strength development allows fast turnaround of repaired areas. High early strength – over 2000 psi in 1 hour. Can be extended with pea gravel for large or thick repairs, which allows for a higher yield. Freeze/thaw durable and resistant to scaling by de-icing chemicals, allowing for excellent long-term performance in cold environments. Contains both polymers and fibers, increasing bond, tensile and flexural strength. Meets ASTM C928 (Specification for Very Rapid Hardening Cementitious Repair Materials). Zero VOC: SURFIX DFS contains zero volatile organic content and is safe for use outdoors and in confined indoor spaces. Screed mortar projects. Deck and ramp repairs. Uneven floor transitions. Sloping balconies and washrooms. Wet area floors to drain properly. Accepts most finish flooring in as little as 12 hours. Can be installed from tapered edge to 3” neat, may be shaved. Over 3” when extended with 3/8” pea gravel, 20 lb by weight. Work time is 15-20 minutes, set time is approximately 30 minutes. Shrinkage compensated, one component, just add clean water. Will not contribute to the growth of mold or mildew. No dangerous emissions or irritating fumes. Environmentally friendly, may be LEED eligible. Wide range for placement, from semi-stiff to semi flowable. Standard covering, such as VCT, ceramic tile, carpet and coatings can be placed in as little as 12 hours. Accepts flooring in as little as 1 hour. Workable for 10-15 minutes. Compatible with most flooring adhesives. No dangerous emissions or irritating fumes. Will not contribute to the growth of mold or mildew. Environmentally friendly. May be LEED eligible. NOTE: Above 85 deg F, use ACI Hot Weather Application Guidelines. Standard floor covering, such as VCT, ceramic tile and action back carpet, can be placed in as little as 60 minutes after application or when completely dry. Suitable for use on all residential, commercial, and institutional applications in North Carolina and South Carolina. Smooth subfloors prior to final flooring. Patching and skim coating all substrates. Transitions, low spots and doorways. Tenacious bond to a wide variety of substrates. Accepts many floor coverings in as little as 15 to 20 minutes. Creamy smooth workability. Exceptional coverage and cost effective. Can be retempered without the addition of water. No dangerous emissions or irritating fumes. Will not contribute to the growth of mold or mildew. Environmentally friendly. May be LEED eligible. Can be applied in conditions up to 99% RH (per ASTM F2170 / Internal Relative Humidity Testing). Water-based adhesives for carpet, VCT, vinyl sheet goods, etc. : As soon as skim or patch can be worked on without damaging the surface. Moisture sensitive adhesives (urethane and epoxy): 16 hours. The best concrete repair materials and the best concrete restoration systems in North Carolina and South Carolina are available from Turning Point Supply in Charlotte NC and Raleigh NC.